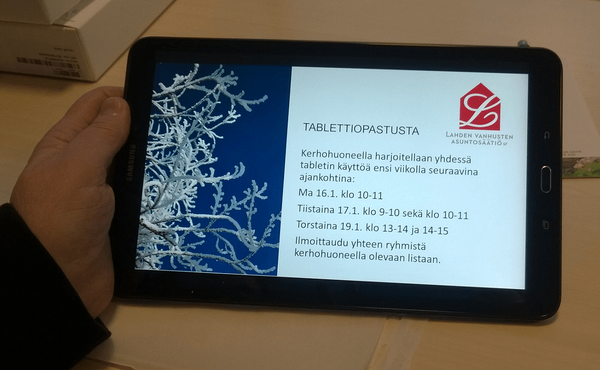 In 2016, Lahti Foundation of Housing and Services for the Elderly constructed a new smart house on Korkeakatu, providing a high-level living surrounding for the elderly. In addition to safety-oriented technological solutions (smart elevator, smart lightning, stove guards, etc. ), tablet computers were provided for all of the 54 apartments in the house. These tablets provide a new kind of a channel for communication and information. A special app was installed in the tablets for easy information gathering and sharing, but otherwise they can be used as ordinary tablets. Orientation for the use of the tablets has been given on a regular basis and it is designed to address the participants’ needs. Before moving in, the inhabitants were involved in the development. For instance, they participated in workshops, where their needs and expectations for the living environment and technology were mapped. After using the tablets for a while, the inhabitants have reported that their overall interest towards new technology has increased. According to the study conducted by LUT Lahti in the KUMOUS-project, these kinds of development processes show that elderly people are willing to learn to use more technology and be active participants in the information society. A meaningful content is especially important in the technology provided. Support and sufficient time for the learning are also an important part of adopting new technologies. These kinds of user-centred practices also have a societal impact: they are likely to provide more equal opportunities to be part of the digitalizing society and to smoothen the digital divide between generations.